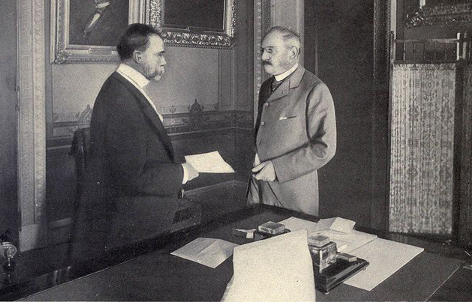 John Hay, US Secretary of State, handing to Jules Cambon, the French Ambassador, the $20,000,000 due to Spain under the Treaty of Peace, at the State Department, from p. 434 of Harper's Pictorial History of the War with Spain, Vol. II, published by Harper and Brothers in 1899. Article I. Spain relinquishes all claim of sovereignty over and title to Cuba. And as the island is, upon its evacuation by Spain, to be occupied by the United States, the United States will, so long as such occupation shall last, assume and discharge the obligations that may under international law result from the fact of its occupation, for the protection of life and property. A line running from west to east along or near the twentieth parallel of north latitude, and through the middle of the navigable channel of Bachi, from the one hundred and eighteenth (118th) to the one hundred and twenty-seventh (127th) degree meridian of longitude east of Greenwich, thence along the one hundred and twenty seventh (127th) degree meridian of longitude east of Greenwich to the parallel of four degrees and forty five minutes (4° 45' ]) north latitude, thence along the parallel of four degrees and forty five minutes (4° 45' ) north latitude to its intersection with the meridian of longitude one hundred and nineteen degrees and thirty five minutes (119° 35' ) east of Greenwich, thence along the meridian of longitude one hundred and nineteen degrees and thirty five minutes (119° 35' ) east of Greenwich to the parallel of latitude seven degrees and forty minutes (7° 40 ) north, thence along the parallel of latitude of seven degrees and forty minutes (7° 40 ) north to its intersection with the one hundred and sixteenth (116th) degree meridian of longitude east of Greenwich, thence by a direct line to the intersection of the tenth (10th) degree parallel of north latitude with the one hundred and eighteenth (118th) degree meridian of longitude east of Greenwich, and thence along the one hundred and eighteenth (118th) degree meridian of longitude east of Greenwich to the point of beginning.The United States will pay to Spain the sum of twenty million dollars ($20,000,000) within three months after the exchange of the ratifications of the present treaty.